One young man who's in a bout with cancer explains why no one should scoff at affordable health care. I was once invincible. Or so I thought. Like many young people, I was convinced that worries about my health were a world away. That is, until my whole world came crashing down around me last September. For the last several years, I have worked with many talented and dedicated people to make sure that LGBT people are included in the Affordable Care Act, or Obamacare, but my work took on a whole new meaning for me when I learned that at age 27, I had cancer. For most of my adult life, I didn’t really have much personal interaction with the health care system. I really only went to the doctor for care related to gender transition. This is pretty typical for a lot of transgender men like me. But last year, shortly after my 27th birthday, I started worrying. Worrying about a lump on my tongue that was growing. Worrying that something was really wrong. Over the next several months, I had a 12-hour surgery to remove and reconstruct half of my tongue and remove my lymph nodes, which also had been invaded with cancerous cells. I also had six weeks of daily radiation, weekly chemo, and that isn’t even all of it. My treatment ended in January 2014, and even now my body is still aching and tired. So it might not seem like I’m very lucky — but I’m certainly very fortunate. That’s because my employer has offered me high-quality health insurance that kept a bad situation from spinning out of control. Had my employer not provided me this coverage, I may have made the same potentially deadly mistake too many young people make: I would have chosen not to get health insurance. Without health insurance, I wouldn’t have been able to choose Johns Hopkins, whose talented surgeons were able to save enough of my tongue that I am still able to speak. Without health insurance, I would not have been able to afford treatment — which has cost well over $100,000 — without bankrupting myself and probably my parents. Without health insurance, I may not have even gone to the doctor who diagnosed my cancer, and I could be living in ignorance about the fast-spreading disease that was inside of me. But a lot of LGBT people aren’t that fortunate. Research done by the Center for American Progress revealed that one in three LGBT adults living under 400 percent of the federal poverty level, which is just under $47,000 a year for a single person, is uninsured. Nearly two-thirds of people in my age bracket, 18-to-34-year-olds, had put off health care in the previous year because they couldn’t afford it. It terrifies me to think what my prognosis would have been if I had put off my medical care any longer. The Affordable Care Act can change those things. Many of those uninsured LGBT adults will be able to get subsidies that function as discounts on premiums for insurance. Everyone finally has a shot at comprehensive coverage. None of us can get turned down because we’ve been sick in the past, or because of our sexual orientation or gender identitiy. All we have to do is take the simple action of visiting healthcare.gov or visiting a local Navigator to get information and check out options. I know the law isn’t perfect, especially for those of us who are transgender. A lot of plans still don’t cover transition-related care, which is often just as lifesaving for us as the treatment for my cancer has been so far. But taking care of our health may require participating in a currently flawed system. That system can change, but deadly diseases cannot be cured by the strong will alone. Our LGBT community is resilient and strong, and particularly for those of us who are young and have our entire lives in front of us, it may feel like we are invincible. I’ve learned the hard way that I’m not. Cancer has taken a lot from me physically and emotionally. But it hasn’t taken away my voice, and it hasn’t taken away my hope. I hope to find out two weeks from now that I’m cancer-free. With open enrollment coming to a close March 31, I want to make sure other young LGBT people understand why getting covered is so important. I hope that my community will listen when I say — please, take care of yourselves. Be out, be healthy, and get covered. 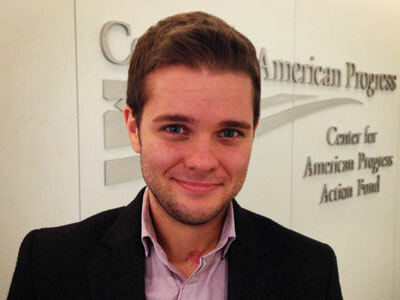 ANDREW CRAY is a policy analyst for LGBT Progress at the Center for American Progress.